If your car has broken window winder, take the time to contact the service center. This detail can be easily replaced independently. 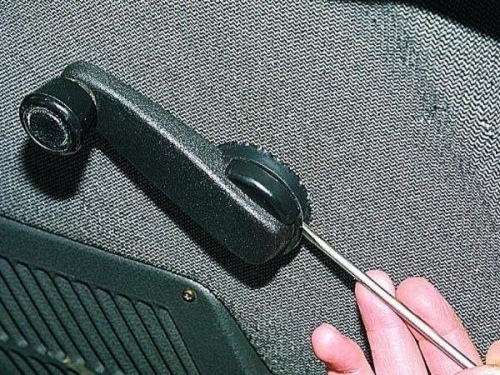 Consider the example of how to remove and reverse the handle the mechanical window of the car VAZ - 2109. - new handle complete with latch and washer. Insert a screwdriver between the latch and handle washer, window regulator. Pry tool and press the latch handle. Pull the latch on itself and remove it (photo 1). Remove faulty window regulator handle. Remove the washer (photo 2). To install the pen, proceed in reverse order. Install the washer included in the kit with a new handle. Hold the puck with your hand, place the handle on the window lift mechanism. Slightly rotate the handle to "hook" over the splines with the gears of the window regulator. Fasten latch set handle. Check the replaced parts, raising and lowering the door glass. If the door of your car very hard climbs and released the glass, the replacement handle will not help here. The problem in the window lift mechanism. Perhaps the faulty lifting/lowering rope or work the splines of the gear mechanism. In this case, it is necessary to replace the window regulator. 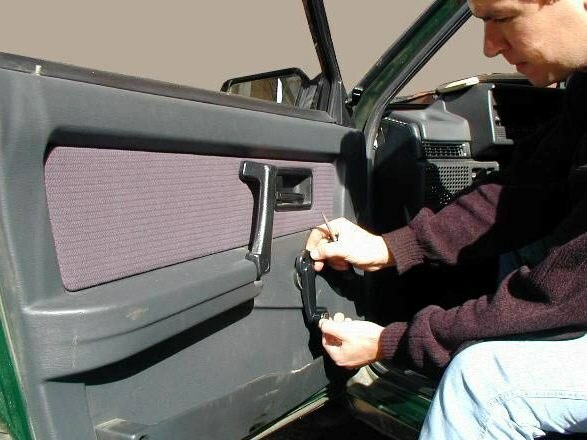 To put the new window without removing the glass, remove the door of the car. 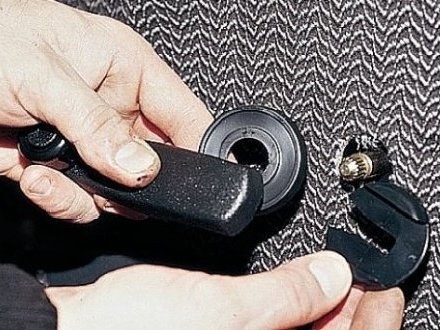 Remove the window regulator handle and the handle of the armrest on the door with a screwdriver prying off the decorative caps and unscrewing the Phillips-head screwdriver screws of its fastening. Unscrew the screws of the door pocket, remove it. Lightly pry the trim on the handle, opening the door, and remove it. Unscrew the lock button of the door. Pry with a flat head screwdriver upholstery that is secured with eight rivets, remove it. Unscrew the head "by 10" two bolts securing the glass to the window lift mechanism. Raise the glass with your hands up. Head "10" Unscrew the nuts fastening the window lift mechanism. Remove the item through the window door panel. Install the new window regulator, having done all the operations in the reverse order. Secure the glass. Install the window regulator handle. Test the mechanism a few times by raising and releasing the glass. If everything is in order, remove the handle and attach the door trim in place. 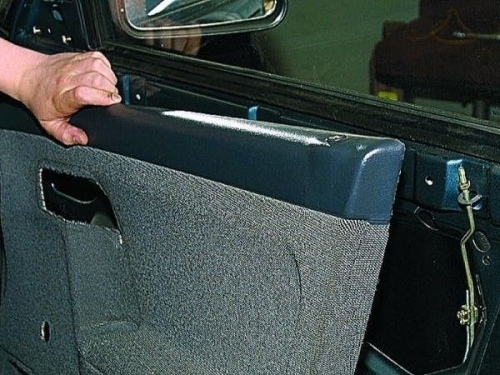 Then put the lock button, door window crank and armrest, pocket and trim on the door handle. When selecting a window winder, pay attention to its quality. 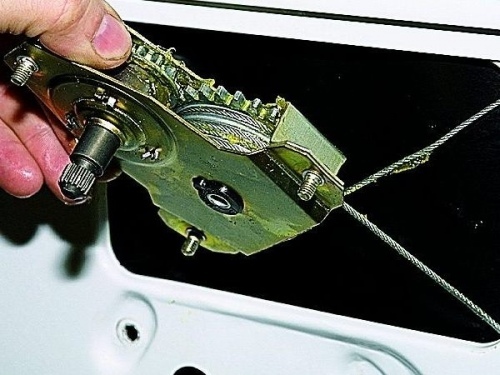 Handle with metal insert under the splines of the gear mechanism of the window regulator will serve you longer.